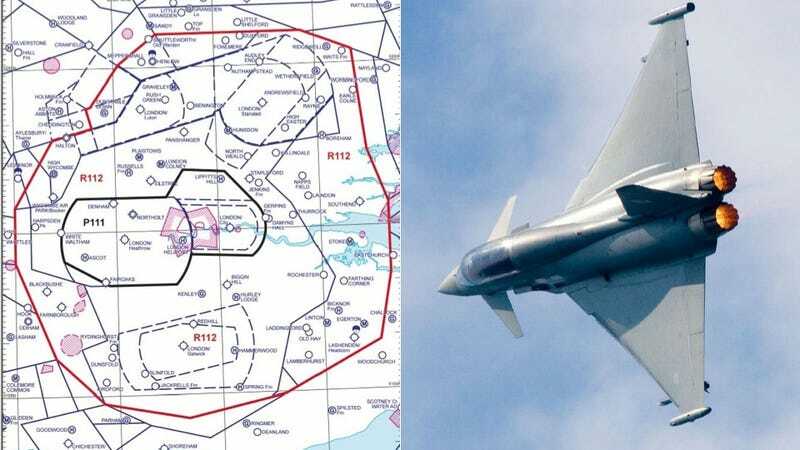 We're all excited to see Michael Phelps boil entire swimming pools with sheer athletic power, but above the Olympic fun is some serious military air business: London is ready to shoot you down. All pilots have to be in constant communication with "Atlas Control". Even those that are within 10 nautical miles of the outer boundary are expected to keep an ear on the Atlas frequency at all times. If interception is performed by a helicopter, it will approach the target on the left side and rock its aircraft, the target aircraft will be expected to rock its wings and follow the helicopter, failure to comply will result in the helicopter displaying a sign which reads "follow me" again, the target will rock its wings and follow the helicopter. A third attempt will then take place. The helicopter will alert the target with a green laser or fire a flare and failure to comply may be deemed to require an armed response. The helicopter will be armed with a sniper who will have several weapons at his/her disposal, this would be as a last resort. If intercepted by a Typhoon, the fighter will join the target at the left and rock its wings. As above the target needs to respond by rocking its wings and follow the Typhoon; if this does not happen the Typhoon will break from left to right on from of the target aircraft and failiure to comply will result in the Typhoon again breaking from left to right in front of the target whilst firing flares. The decision then will be taken as to shoot down the target.